Sigurd Persson for Kockums, woodburning stove, black cast iron, Sweden, 1960s Original woodburning stove designed by Sigurd Persson in the late 1960s-1970s. The fireplace is decorated with circles on the side. The high legs lift the stove from the ground, which makes the design more airy. The piece can be a sturdy, sculptural addition to your interior or patio. In this case suitable for both the winter and summer season. Sigurd Persson (1914–2003) was a Swedish sculptor and blacksmith. Growing up in a goldsmith family, Persson founded his own studio in Stockholm in 1942, and during his long career he designed objects in various materials such from metal to glass and plastic. Original antique cast-iron French tiled stove from circa 1890. 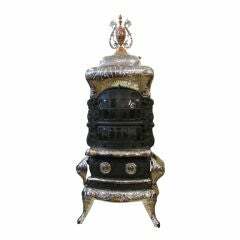 Dimensions: 80 cm high, 85 cm wide, 50 cm deep. American Victorian round wrought iron pot belly stove with urn finial and steel rim (14 sections) Magee Furnace Co., Boston, mass. 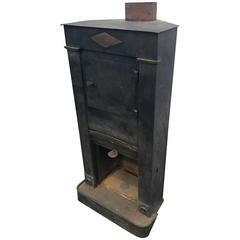 Early 19th century iron wood burning corner stove. The stove was in Charles Spada's home in France for many years. In addtion to being handsome, it's in good condition.